Oh yes, the, uh, the Norwegian Blue. What’s, uh, what’s wrong with it? I would like to start this review with an admission, dear reader, that I’m a Monty Python fan, so this review may be biased. Ten or so years ago, I sat with a pair of promotional half coconuts in Trafalgar Square in London as part of a world record ‘coconut orchestra’ attempt to promote the original West End cast show, before a free open air screening of Monty Python and The Holy Grail, the film on which this musical is ‘lovingly ripped off’ as the promotional materials all state. Biased in favour or not in favour, I’m not sure, but it’s not going to be an entirely impartial review. I guess when a show is working with such source material it’s always going to be hard to write an impartial review. Reviews for shows at Storyhouse at the moment may also flag up how lucky we are to have this arts and cultural centre in Chester, due to how recently it has opened. This is all true. It is a fantastic building and we are very lucky to have it but I’m reviewing Spamalot, not Storyhouse. Let us not talk of this again. 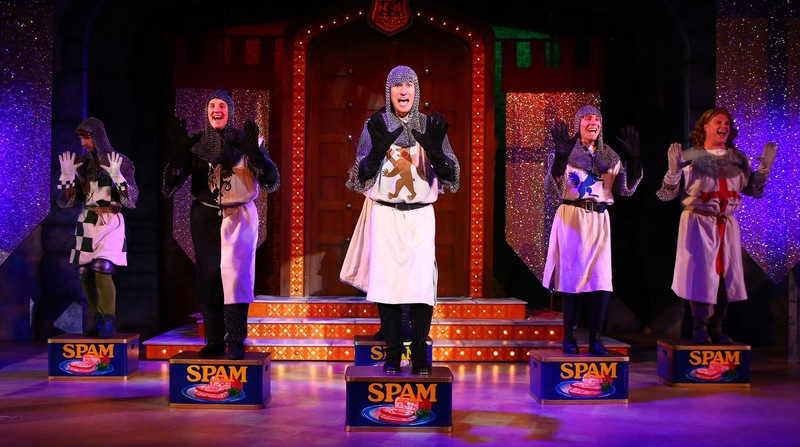 Monty Python’s Spamalot, produced by Selladoor Productions in conjunction with Mercury Theatre in Colchester, has arrived in Chester in all its coconut clicking glory. The show takes us on a journey with King Arthur and his sidekick Patsy, who set off with a group of knights to find the legendary Holy Grail. It opens with a number entitled Fisch Schlapping Dance, wonderfully merging Python’s Fish Slapping Dance with a large wink to Palin’s original Finland song before ending with a declaration of ‘I said England, not Finland.’ And coming to an abrupt end. All very, very silly and very Python. As the tagline suggests, it does lovingly rip off Python’s original film, with most the script being taken directly from the film. All of the knights from the film, including the Black Knight and The Knights that say Ni are present and correct; as are the insult-spewing Frenchmen and The Killer Rabbit of Caerbanno. Despite the musical now being over a decade old, it’s been kept fresh, with the script being kept up to date with references to Trump and fake news. Along the way, the show parodies other musicals, most notably taking several clear swipes at Lloyd Webber with The Song That Goes Like This. Nods along the way are given both in script and set design/staging to Les Mis, Miss Saigon and West Side Story. There’s even a Fiddler on The Roof-esque tap dance number on Spam cans during The Knights of The Round Table. One number entitled You Won’t Succeed in Showbiz tongue-in-cheekily talks of how hard it is to have a touring musical without a celebrity star. Previous Spamalot casts have included Tim Curry, Warwick Davis, Phil Jupitus and Marcus Brigstock, to name but a few. Looking around the theatre to see a few gaps in the stalls and a three quarters empty circle, you can’t help but wonder how much truth there actually is within the song. That said, it was Halloween and a Tuesday night in Chester so they hadn’t by any means done badly in the number of bums on seats. The cast are wonderful. As with the original Python team, the cast, with the exception of all but two (I think), take on multiple roles. Whilst maintaining the feel of Python’s original character make the characters their own. Bob Harris plays the role of King Arthur with perfect comedic timing and in his trusty sidekick Patsy (Rhys Owen) we find a fantastic vocalist, as is acknowledged in the script. However, it is Sarah Harlington’s performance as Lady of the Lake that really steals the show, particularly during a number entitled Whatever Happened to My Part? when her powerful voice really gets to shine. It’s hard to find any fault with them. The faults with Spamalot all lay firmly at the feet of Eric Idle. It’s a fantastically fun show and a great night out but it’s not hard to understand why some of the Pythons aren’t too, erm, enthusiastic about it and the reasons it divides audiences. During the interval I spoke to somebody who quietly confessed she’d not really seen much Monty Python and whilst they were enjoying the show felt they were missing out on a lot. At times it borders VERY close to being Monty Python: The Panto, especially when the fourth wall is broken and the cast interact with the audience. Original Python member Terry Gilliam stated it is very much ‘Python-lite’ and Terry Jones admitted that “It isn’t really ‘Python’”. Quite how somebody unfamiliar with the source material would feel leaving the show, I have no idea. I imagine entertained but bemused. I wish I’d spoken to her again after the show. Spamalot is far from being a dead parrot. If you go along expecting to enjoy an evening of light entertainment then you won’t be disappointed. One thing is certain though, as pretty much any review of Spamalot will tell you, you will be whistling Always Look On The Bright Side of Life to yourself as you leave the theatre. Monty Python’s Spamalot continues its run at Storyhouse in Chester until Saturday.